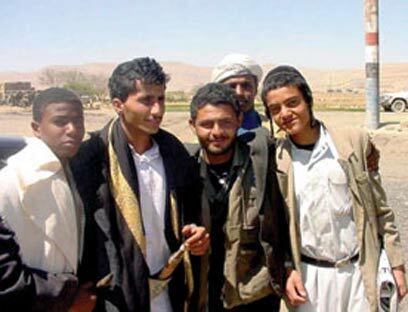 Jewish residents of the Saada region in northern Yemen have received explicit threats to leave the area within 10 days from followers of radical cleric Hussein Badr Eddin al Houthi, according to the Saudi newspaper Al-Watan. Following complaints from the threatened Jews, a meeting of the local authorities and the district's sheikhs was held. The Jews demanded they be treated as equal Yemenite citizens, and at the end of the meeting a religious verdict determining the relationship between them and the Muslims was given. This verdict, which was also signed by Jews, did not guarantee them immunity from threats. Yemenite defense forces have gone to great lengths to try and convince the Jews to stay in their towns. These attempts, however, have failed and the authorities were forced to provide financial aid for the Jews so they would be able to rent accomodation in safer areas. One of the threatening letters said: "They (the Jews) have taken part in actions and movements that serve global Zionism first and foremost, and are working diligently at corrupting people and making them abandon their values, their moral and religious values, and spread all kinds of abominations throughout society." According to the letter, this conclusion was reached "following meticulous surveillance of the Jews living in the El-Hid region in Saada…Our Islam religion compels us to fight the corrupt and denounce them." Yihya Yousef Mousa, one of the Jews who fled their homes, said that the believers' youth organization's chief Yihya el Hadir told him that he and his friends did not want to see even one Jew in Saada. According to Mousa, although they returned to their homes last Wednesday, the youth organization's members continued to harass them, threaten them with kidnappings and steal their money and cars. "Where do they want us to go?" asked Mousa. "The second threat was received after we returned home following official instructions. Four masked people approached us and told us that if we are still here by Friday, harm will come to us. The sheikhs of the area are the last ones who can do anything for us." The Jewish residents have filed complaints to the region's governor and even to Yemen's President Ali Abdullah Salah, demanding protection. Yemenite immigrants in Israel have been following these developments. Masoud, a resident of Israel's southern city of Beer Sheva who immigrated to Israel from Yemen six-and-a-half years ago said in an interview on Israel Radio that he was still in touch with his relatives in Yemen. "Those who stayed are stubborn, they don’t want to come here…on Friday they told me that they got letters saying whoever doesn’t leave their home will be killed and have their children taken," said Masoud. Who wants to kill them? "Al-Qaeda, I don’t know where they came from. Now they (the Jews) have seen these letters and are frightened, but what can they do? They have taken all they own, taken the kids, women and all, now they are at hotels. They are afraid, but said that for now they don’t want to immigrate." See all talkbacks "Yemenite Jews under threat"